All ye fans of Reign, I have good news for you. Actress, Caitlin Stasey who plays KENNA on the hit TV show confirmed to me a few days ago that the CW TV Series will be back come fall for Season 2. If you are like me who has been patiently anticipating the return of the show, this news just adds even more excitement to the wait. As you may recall, the season finale saw the death of King Henry II. The previous season also saw a lot of whirlwind romance which left Bash and Kenna hooking up, Lola getting pregnant for Francis then marrying a fake titled man who ended up committing murder and leaving a pregnant Lola on the run. The season finale saw Francis going after Lola when a plaque hit, leaving his wife Mary Stuart in a state she wasn’t too happy about. 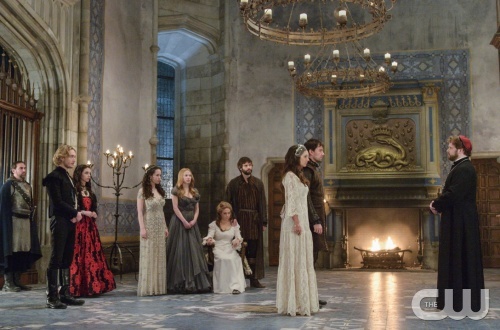 You can read my spoiler here – REIGN Episode 22 Season 1 SPOILERS [Slaughter of Innocence] – CW Tv Series . So much going on in this awesome series that it leaves us with more questions than answers. Now that King Henry II is gone, what will be the fate of France? Will Francis successful take the throne? or will he die from catching the plague during his attempt to save Lola? What will be the fate of Mary Stuart if Francis does save Lola? Will she have to share her husband with one of her best friends? We know that historically Francis died at the age of 16 but this rendition is what I like to call classic fiction so anything can happen. What will happen with Bash and Kenna? If this truly the end of Bash’s love for Mary? oooo so many questions, so little time. I can’t wait!. A part of me wants pre show spoilers but another part of me is willing to wait because I know Episode 1 Season 2 is going to be very exciting to watch. So, save the date, Thursday October 2nd is confirmed as the first day the new season will begin. Are you looking forward to the new season of Reign? What are your predictions? I keep meaning to watch Reign, but I never have. I need to check this out – have not see it before! was meant to start watchingit last year, never got to it.